Today the Shonai area in the top west corner of the Tohoku region is brimming with a mood of creativity and enterprise. This new spirit has given rise to a new university. The twentieth century was the era that focused on money and material goods, and on capital and the rule of the market; but the twenty-first century is the era of people and mind/heart, that we call “Koeki”. This will be a world in which children will be able to live as they should, and people as humanely as they possibly can. The speed of globalization has accelerated in the twenty-first century and people around the world have confronted serious and sometimes increasingly intangible frictions between cultures, religions, and thoughts. We realize that not only whole countries and continents, but also small communities have connected to a global world. In our university, students will broaden their minds and deepen their specialist knowledge through our education in order to respond to these changes in social ethnography and to contribute to the harmonious development of cultural exchange, welfare and economics. We expect our students to be able to understand the different values and cultures, and to find a way toward a more reliable and symbiotic society. Koeki University was established in 2001 due to popular demand from the local people and local governments. The present location along the Mogami River with its silver surface and view of two magnificent mountains (Mt. Chokai and Mt. Gassan), was chosen as the site of our campus and construction began in 2000. 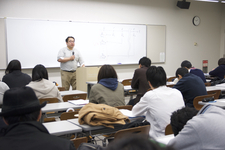 We started, with the invaluable assistance of Keio University, with a single department. By 2014, two departments - Departments of Business/ Policy Management and of Cross-Cultural Studies - were set up; the latter of which includes the International Liberal Arts Program which was newly created to develop a global point of view. We received a COC grant from the Ministry of Education,Culture,Sports,Science and Technology in the pursuit of revitalization and recreation of the local community. We strive to contribute to society and local communities through our distinctive educational system and learning methodology with a global standpoint. Many classes have 10-30 students, allowing teaching staff to give individual attention and detailed guidance to students. In order to provide a higher standard of educational support, guidance is also provided outside classroom hours. Lectures involving field trips to organizations which are engaged in community welfare activities. Actual experience of work at companies and local government offices gives students the opportunity to acquire practical knowledge of their targeted occupations. This course involves lectures and seminars for understanding corporative activities and business. •Solving the problems on local social welfare co-operating with the local government and people. •Various study abroad programs, enabling our students to be international facilitators building bridges between countries and across cultures. Starting from basic theory of how information can be digitalized, this program enables students to master ways of information design which help to connect people without discriminating against the socially vulnerable. International students can apply for undergraduate and postgraduate programs. ⇒click here for International Programs. The applicant must fulfill all the following requirements (For exceptions please ask International Center). education approved by the Minister of Education, Culture, Sports, Science, and Technology, Japan. ・The applicant must have passed Level 1(N1) or Level 2(N2) of the Japanese Language Proficiency Test. ・The applicant must have been granted a resident permit and be able to obtain a student visa after entering KU. The library has a large storage capacity not only for books but also for audio and visual resources, and has the best collection of New Zealand related books and materials in Japan. The materials in Chido Library (Tsuruoka Campus) and in Sakata City libraries can also be borrowed free of charge using inter-library loans. In the library, some computers are available for private study purposes and there are a number of computers that are set aside for language learning. Twenty dormitory houses are located inside the campus. Each dormitory house has 9 private rooms and a common room. 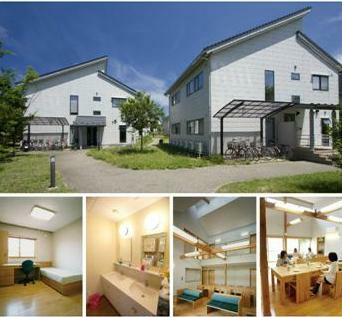 Monthly rent is about 25,000 JPY (approximately US$200). This is a modern cafeteria, equipped with Wi-Fi, with over 300 seats. 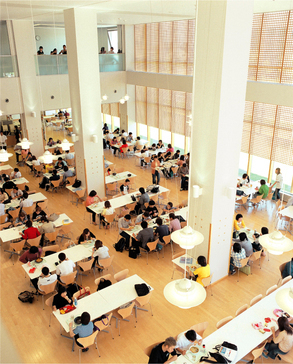 It is a popular, bright and spacious place where students can eat, study and relax. A gym, tennis courts, soccer field with a running track are available. 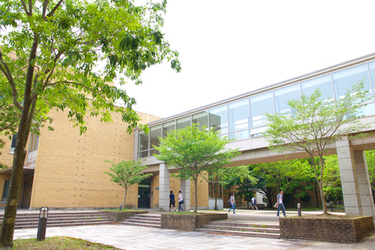 The place of study for Koeki students is not only on its campus but also all areas of Shonai. The Shonai area is surrounded by all kinds of nature. Many historical and religious buildings and natural heritage sites still remain intact, such as Mount Haguro (which has three stars in the Michelin Green Guide Japon) and Zempoji Temple in Tsuruoka and Sankyo Warehouses and the Honma Residence in Sakata. Also famous is the local cuisine with seasonal foods such as fresh seafood (Sakata is a port city), top rated rice and a wide variety of fruits and vegetables special to the area. ⇒Click here for Sakata tourism site. 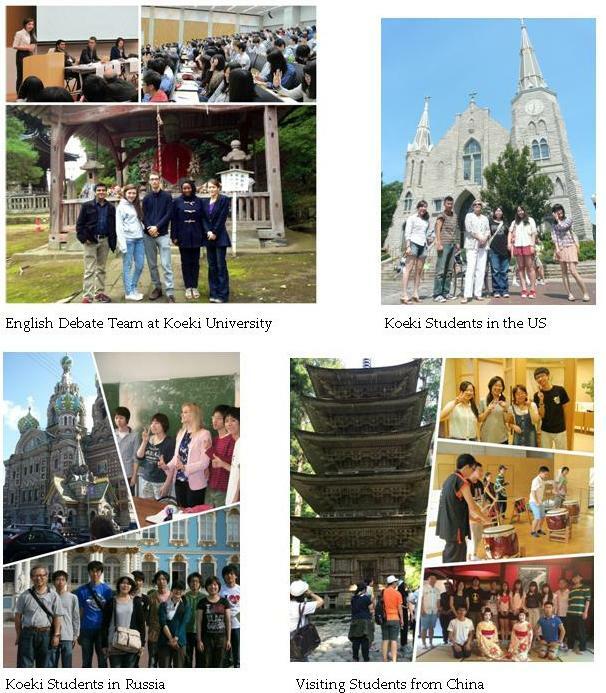 Study and Exchange Programs at Koeki University for Our Students and International Students. For International Students Wishing to Study at Koeki University. If you are interested in experiencing Japanese culture and studying along the beautiful Japan sea coast in the rural Northwest countryside, join us on some of the many courses taught in Japanese at Koeki University. 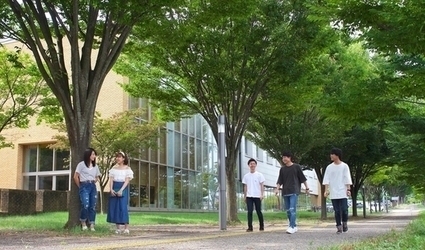 Koeki University welcomes students from all educational, ethnic and cultural backgrounds as well as disabled or minority students, and is very flexible for time frame and personal preferences that match students’ curriculum goals and needs. We are very aware of students’ individual restrictions and are able to accommodate intensive study hours due to our system of quarterly (7-week) as well as semester (14-week) courses. Students may enroll for one year or two years that will count toward credits for their degree in their own country. International students should have an interest in learning Japanese, in Japanese culture, ethics and lifestyle. Immersion based learning can be mixed with some classes in English. Immersion based classes should be in a subject closely connected to that the student is taking at their own home university. 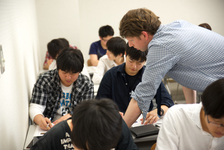 There are a number of courses taught in English (including Economics, Presentation Skills, Academic Writing, Japanese Culture, and some Social Welfare courses/ Field Work) so students can pace their study of Japanese and earn credits from these as well. There is a list available here of all courses (ones with titles in English are taught primarily in English). • individual needs-assessed options. For full details of home stay or resident hall options and estimated financial costs please contact us. Costs vary according to students’ requirements and needs. You can apply directly via mail to the International Center (see Contacts) with any questions and to ask for an application form. 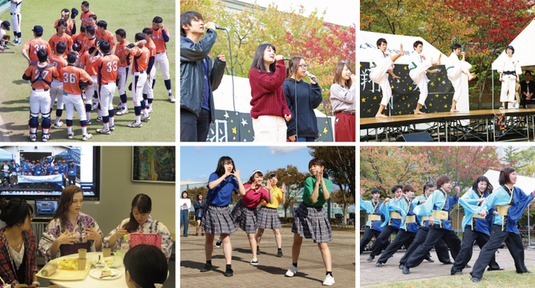 Koeki University Students Study Abroad Options. Below is the list of established contacts and schools we are currently sending students to and accepting students from. We hope to expand this list and continue to connect and make affiliations with universities from all over the world to give our students the most flexibility and choice within the design of their own degree. Please communicate in English or Japanese. Please communicate in English, Japanese. Please communicate in Chinese, English or Japanese. For enquiries concerning international and exchange students please use the inquiry form below.